You have stayed away from L’Aquila for obvious reasons since the earthquake struck five years ago on April 6th. You don’t want to be one of those nosey tourists photographing misfortune. Maybe you only have a few precious days in Abruzzo and with the sea beckoning and the fresh mountain air promising rejuvenation, you convince yourself to visit when everything is back to normal. Well, you’re missing out on something wonderful. On my recent return to the city, wandering around just off Piazza Duomo on via Sasso at Piazza S. Biagio, I noticed a most welcome sign. INGRESSO. In company with the Irish pub next door, it’s the only building on the street open for business- Catholic business. The church of S.Giuseppe di Artigiano is the first church (now elevated to a third tier basilica) to be fully restored. The bones of Abruzzo’s beloved Celestine V lie here for now until repairs at the Basilica di S. Maria di Collemaggio are completed. But that’s not what I am so excited about. Giovanni Gasparro, a young artist from Bari (Puglia) was commissioned to decorate the renovated interior with 18 paintings. These are no ordinary church paintings. Each of them, even the three depicting local martyrs, is captivating. 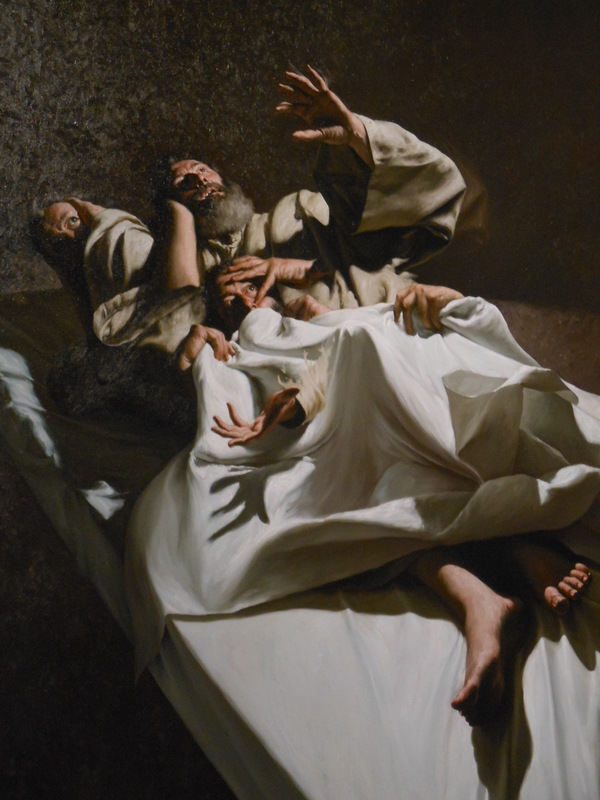 Gasparro renders his subjects with multiple hand, body or facial gestures depicting emotional or spiritual states. These are powerful works, even more moving when you are familiar with the subject in the painting. The following three photos of St. Joseph and St. Peter are my amateurish ones. 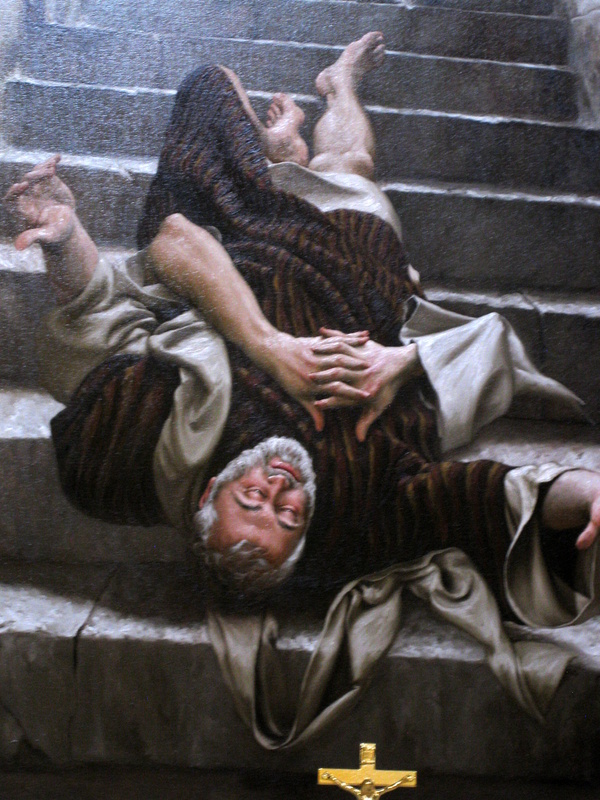 I encourage you to visit Gasparro’s website for better images and even more provocative paintings from this collection and to have a look at his stunning non-secular work as well. Most of us have a soft spot for Joseph the devoted carpenter who married pregnant Mary and who is barely mentioned in the gospels. In Il Sogno di san Giuseppe, he is portrayed reacting to a nocturnal visit from a heavenly messenger calling him to partner up with the soon- to -be mother of the son of God. Gasparro gives us a lot to ponder – Joseph’s surprise, anxiety and consent. Transito di san Giuseppe prefigures the Pieta. But it is Joseph who lies dead in the arms of Jesus with a grief stricken Mary looking on. In Il Pentimento di san Pietro, Peter, fallen and repentant after his betrayal of Jesus, is positioned with Dantean symbolic retribution in an upside down suggestion of the crucifixion. I left this church after two hours of being absorbed with the smaller iconographic pieces mounted above the major paintings and moved by the artistic and creative power of main canvases not shown in this post. Then I returned a week later to enjoy them again. The church itself has quite a history and a previous name, S. Biagio d’Amiterno. It’s been rebuilt five times and from this latest rubble a 13th century Giotto school fresco was discovered. To read about the hoopla regarding the renovation of the façade, click here. After seeing Gasparro’s masterpieces, have lunch in centro. 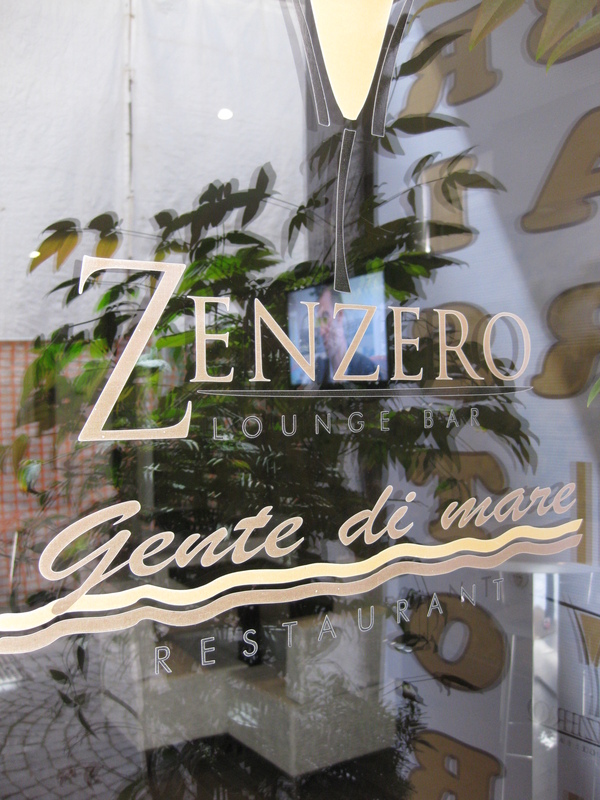 Zenzero (via Garibaldi 27) and Il Guastatore (via Guastatore 2) are among those open. 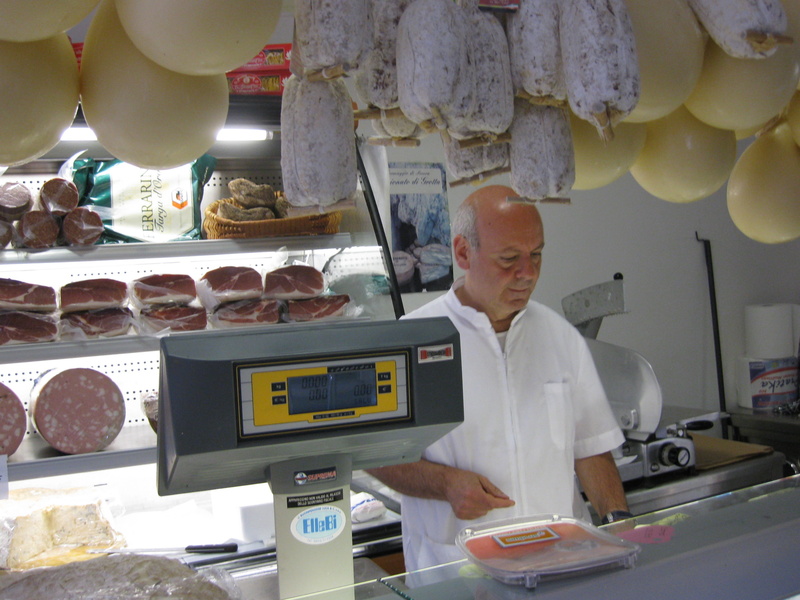 Pick up some pecorino, salumi or terrific hazelnut cookies from La Camoscina (Corso Federico 58). Drink a Guinness at Silvestro’s Irish Village. There is new treasure in L’Aquila for those willing to embrace the slow recovery of this university town. 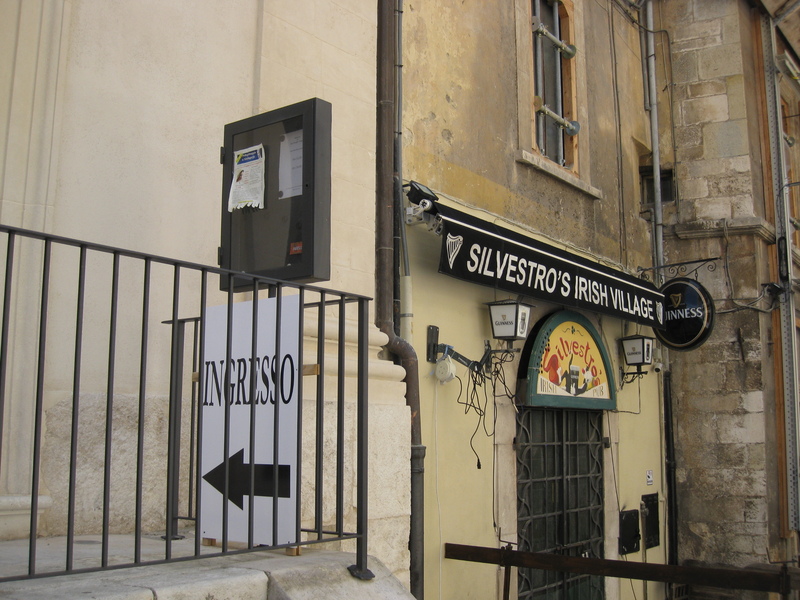 Giovanni Gasparro, in contributing his brilliant paintings, has given us reason enough to re-enter the historic center. Helen, you may not post often but when you do it is always something worth reading. I love this post. How good it is to see these welcoming signs in l’Aquila and also to see the work of such a talented young artist. I look forward to visiting the city and the church this summer. Thanks for your encouragement, D. It does work! I can’t wait to see them again myself. I only posted the tame ones! Thank you. I didn’t realise that things were slowly reopening and information can be hard to come by. I’ll certainly try and make a detour soon. Estimates for full recovery are in the 20 year range, but do pop in! Park near Hotel San Michele- just follow the signs. It’s a pleasure to meet more travelers who enjoy Abruzzo, Molise and Puglia. Love your blog Mixoilandwater. This is really beautiful, Helen. I appreciate that, Amanda. Thanks for stopping by.